Our friends Carlton and Eric at the Disposable Film Festival are putting on an awesome party next Wednesday May 13 in conjunction with The Guardian and Good Hotel. 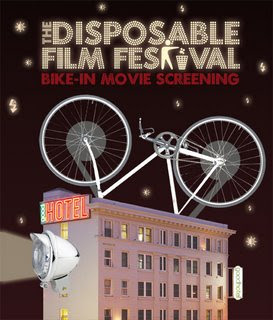 It's the festival's first Bike-In Movie, including a sampling of the festival's bests, including some sweet bike films. Vélo Vogue will be there snapping portraits of fabulously clad cyclists as you roll onto the red carpet and and park your bike with the SFBC's bike valet. It's the place to see and be seen, so we'll see you there!